Barry and the Dems are determined to force Obamacare down our throats. President Barack Obama has proposed changes he thinks should be included in the changes made to the Senate health care bill as Democrats move ahead with their plan to railroad the bill thorough Congress via reconciliation. 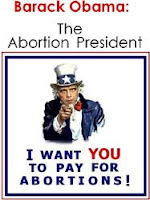 However, Obama does not propose any changes to the massive abortion funding. The current Senate bill contains massive abortion funding that could force taxpayers to fund hundreds of thousands of abortions and it has other pro-abortion problems. But the new Obama health care proposal, unveiled today in advance of the White House health care summit, leaves intact that Senate language funding abortions. It opens the door for Rep. Bart Stupak, whose amendment stopped abortion funding in the House version of the bill that will be tossed aside, to gather a group of 10-12 pro-life Democrats who voted for the House bill to oppose the Senate version. The Obama plan also violates his pledge to Congress and the American people that his version of health care reform would not force taxpayers to fund abortions. He keeps lying about this, He keeps denying the massive abortion funding that is included. In a September nationally-televised speech to Congress, Obama sought to clear up projections from pro-life advocates that his health care plan would fund abortions. "One more misunderstanding I want to clear up -- under our plan, no federal dollars will be used to fund abortions," Obama claimed. Under the Senate health care bill that will be the main bill Obama and Democrats push through Congress, there is no ban on abortion funding. Wile some states can opt out of funding abortions under the plan, taxpayers in other states will be forced to pay for them.